You are here: Home / Managed Moms / Weekly Pet Pic: A Dog On A Cat Tree?? This week’s pet post comes from one of my favorite bloggers, Trisha with momdot.com. Be sure to check out her cool and very popular blog. When I asked her permission to use this funny picture from her website, she wrote me right back and told me that her family has six rescue pets! Kudos to them for their kindness and ability to give six lucky animals a loving home. Here are several of the pets and when I saw her dog using a cat tree, I just had to make that this week’s pet pic…. 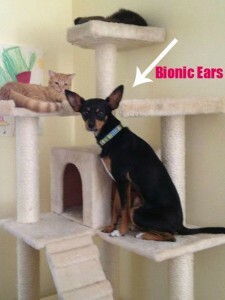 Non only is Trish’s dog is a good friend to her cats, but he is also a good watchdog with his bionic ears. I just love this funny picture! You can see more of Trisha’s pet articles, parenting articles, recipes, giveaways and more at her momdot.com blog Thanks for sharing Trish! This picture reminds us to find some quality play time with our pets this weekend because it is good for them and for us humans. Send us your pet pics. We love to post them and we have received some great ones so far. Click under the Pet Pic section to see the gallery. Email you pet pics to rachel@managedmoms.com and have a great weekend. thankyou so much for sharing it! My animals are so weird, but arent they all?